Antalya is known as the Turkish Riviera, rightly so, with the diversity on offer. From the historic attractions of the upmarket Side area, to the Luxury golf courses and lavish resort hotels of Belek, Kemer, Lara and Alanya, this region is home to the best that Turkey has to offer. For those looking for a more authentic stay in Antalya region then you should choose 'Kaleici', translated this means "inside castle". It offers a traditional ambience of Turkish culture in the old quarter in Antalya with its very own restored Roman harbour. Leading to this is the narrow cobbled streets and old Ottoman mansions of the area. Worth the short walk as upon arrival you find the perfect setting for Al-fresco dining. For beach lovers, the Antalya region is the ideal choice. With its mainly soft sand and fine shingle beaches, the region is known for its crystal clear waters. Antalya is an astoundingly beautiful area of southern Turkey that offers something for absolutely everyone, from the flawless white sand of Lara Beach, to the fascinating Roman aqueduct and acropolis in Antalya City. The Antalya region boasts miles of clean sandy beaches as well as sites of natural and historic beauty and simply can’t help but impress those looking for the perfect place in the sun. All of the coastal resorts have miles of perfect white sand beaches with unparalleled views of mountains, mariners and forests depending on the resort you visit. But Antalya is more than just gorgeous sun and sand, Turkish history is ingrained everywhere you look. Almost all of the regions of Antalya have a deep history evident in castles, churches and ancient mosques that are each as unique and beautiful as the next. However, the most impressive consist of Alanya Castle, a immense fortress built in Seljuk times, the remains of thetemple of Apollo in Side and the vast Roman theatre Aspendos, still used for the International Opera and Ballet Festival.But no matter whether it is the crystalline waters of the beaches or the majesty of ancient architecture that is more alluring, there is one thing to be sure of and that’s the entertainment. Classic Turkish restaurants offer some of the freshest dishes due to the multiple mariners throughout the Antalya area and there is an abundance of shops. Numerous golf courses, museums, bars and bazaars all allow an opportunity to relax and enjoy the day, or experience a thriving night life. Because of this, Antalya is a popular holiday region and yet each resort offers opportunities to experience something completely unique. 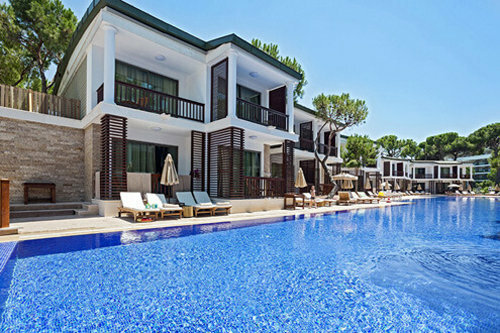 Overall, Antalya truly offers something for everyone.